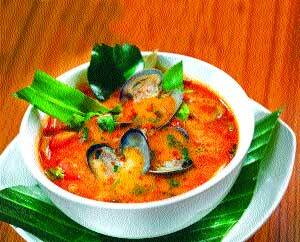 Renowned as timeless Thai flavour, tomyum soup with clams, a recipe by chef Nguyen Van Tuan of May Man Chinese Cuisine, is loved for its wholesome broth teeming with clams, mushroom and kaffir lime leaves. A perfect definitely must-try combination! Clean the clams and put aside. Stir fry the clams and add in the lemongrass and red chilli. Pour the water into the mixture and bring to a boil. Add mushrooms, tomyum paste and the spices into the mixture then bring to a boil.